Every successful dividend investor has their own set of guidelines for selecting stocks. Whether it be following the lead of other prominent dividend income investors or setting up criteria of their own – it is critical to have a strategy for selecting stocks. Over the past several years, I have adopted the views of several different dividend income investors and made a few tweaks of my own. I thought I would share my latest strategy for selecting dividend income stocks by breaking it down step by step. Here are the 8 steps that I follow at the beginning of every month to screen for top blue chip dividend paying stocks. For a comprehensive list of helpful investing information, please check out our Dividend Stock Resources page. At the beginning of every month, I go to The DRiP Investing Resource Center and download the latest U.S. Dividend Champions list. This list is published at the end of each month and is a great place to get ideas for dividend income investing. If you want to save a ton of time filtering out non-dividend stocks, I highly recommend finding a list of dividend stocks. Whether you start with the Dividend Champions list, Dividend Aristocrats, or some other published list – you need a starting point. Note – The Dividend Champions list is the best free resource I have found. It has a ton of useful information that saves me a bunch of time each month. Once I download the U.S. Dividend Champions list, I usually start by looking at the combined list of Champions, Contenders, and Challengers. For those that do not follow the U.S. Dividend Champions, here is a breakdown of the different categories. 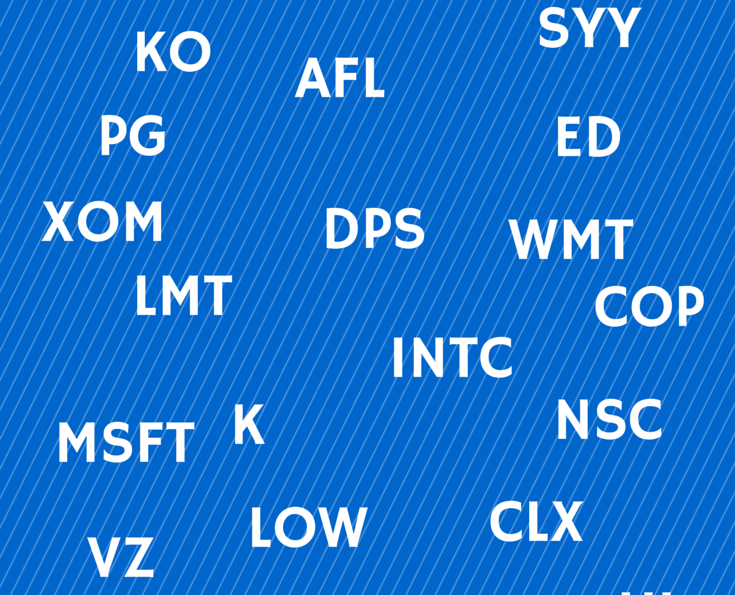 The combined list from the 3 categories consists of over 600+ dividend paying stocks! This is by far the most comprehensive list of dividend stocks I have seen. Now that we have our list to start, the first step is to set a filter on the dividend yield. I look for stocks that have a current yield that is greater than 2.5%. I have occasionally played around with this number in the past by raising the filter up as high as 3% and as low as 2%. Overtime, it seems like 2.5% is a good place to start. Raising the filter to 3% would exclude top dividend stocks like Aflac (AFL) and Johnson & Johnson (JNJ). Lowering it to 2% adds too much clutter when searching for stocks – especially with over 600+ to start from. Once I filter down to companies that have a dividend yield greater than 2.5%, I look at our next criterion – payout ratio. The dividend payout ratio is the percentage of earnings a company is paying to shareholders in the form of dividends. I look for companies that have a payout ratio that is less than or equal to 60%. At one time, I had this filter set to anything less than 70% but found that to be too risky. One thing to watch out for are companies that have a payout ratio that is increasing year after year. That could be an early sign that the company may not be able to sustain the current yield and a dividend cut may be on the horizon. Setting my filter to look for companies with a value less than 60% helps lower the risk of buying stocks that may not be able to support the dividend in coming year. Remember – we are looking for companies that increase their dividend payout each year – not lower it or cut it outright. After filtering down stocks that have a dividend yield >= 2.5% and a payout ratio <= 60%, I then filter down even further using price to earnings ratio. I only look to buy dividend stocks that have a trailing twelve month P/E that is less than or equal to 20. This criterion helps me from overpaying for a stock that may otherwise meet the other criteria I am using. I want to stretch my investment dollars as much as possible, so it is important to buy quality dividend stocks that are attractively valued. At this point, I normally have a really good list of dividend stocks that have modest yields, low payout ratios, and are not overly expensive. The next step is to narrow down the list even more by looking for attractive dividend growth rates. I have played around with this filter a lot over the years. For now, I have settled on screening for stocks that have a 10 year dividend growth rate that is greater than or equal to 6%. Remember that we want stocks that have a history of increasing dividends for many years. The filter that I have set makes sure to only pick companies that have averaged 6% or more annual dividend growth for the past 10 years. I have moved this filter up to 7% on occasion but feel like 6% gives me the best options to invest. The next step I usually take (but not always), is to screen for # of years of consecutive dividend increases. Before adding this filter, I like to scan the list looking for companies that I may have heard of or are familiar with. If a stock jumps out at me, then I may not look at consecutive years of dividend increases (although it needs to be 5 years to be on the list). The majority of the time however, I will filter down the list even more looking for companies that have increased their annual dividends for at least 10 consecutive years. Some companies actually make it past the 10 year dividend growth rate filter, even though they have not increased dividends for 10 consecutive years. Usually after step #7, I have a list of 50 or less stocks to look at. My last and final step filtering down my list of potential dividend stocks to buy involves the Graham Number. I won’t get into the specifics of this value, but it is a quick way to tell if a stock is trading at fair market value. At this point, I am looking for stocks that are trading at a discount if I can find them. If my decision came down to buy 2 or 3 stocks that are similar, I look to see which one is the cheapest. If everything checks out with the company, then I add these stocks to my watch list for the month. For the past couple of years, I have followed a monthly routine where I screen for top dividend stocks. I use the 8 steps listed above (give or take #7 & #8) to screen out not only the top dividend stocks, but those companies that may be trading at a discount. While I try and follow the steps listed above each month, there are times when I alter my screening process depending on different circumstances. For example, I would like to be diversified across all 10 sectors that are defined by Standard & Poor’s. I know that is impossible to accomplish in a dividend income portfolio, but I also don’t want to get over-weighted in just one or two sectors. Just because a stock is on my watch list doesn’t mean I am going to buy it. I also like to play around with the numbers each month. For example, I may leave my filter open to look for any Dividend Challengers that are close to hitting 10 consecutive years of dividend increases. There may be the opportunity to find a future dividend star in this group. What type of criteria do you use to build your list of dividend stocks?